After touching down in New York, one of the most surreal feelings in my life (soon to be beaten in a few days time) was driving over the Queensboro Bridge in the back of a yellow cab as the Manhattan skyline appeared in the distance. It was a total pinch me moment! We quickly dropped our cases off at the hotel, added more layers of clothing and rushed straight back out of the door. We had a quick explore of the surrounding Midtown area and caught our first glimpse of Times Square at night. After a full day of travelling and a good nights sleep in our new home for the week, we woke up bright and early, eager to explore! After a standard New York bagel breakfast with coffee we headed outside to see our first glimpse of the city at morning, against a clear blue sky backdrop! We thought a great way to get our bearings would be to take a tour of Midtown and Downtown. So we headed off up to Times Square to join a tour. The tour took us around Midtown past Macy’s, Madison Square Garden, down 34th past the Empire State Building and down 5th Avenue past the Flatiron Building. It then headed off into Greenwich Village where we caught a peek of Washington Square Park, straight down Broadway past Soho and into the Financial District where we saw the World Trade Center and Wall Street. After a brisk stop off at Battery Park in the crippling icy wind, the second part of the tour took us back up into Midtown via China Town, Little Italy, East Village, United Nations, Rockfeller Center and the bottom of Central Park. A little later that night after a few beers whist getting ready, we walked the couple blocks over to Madison Square Garden to watch our very first NHL game. The game aswell as the atmosphere was amazing! 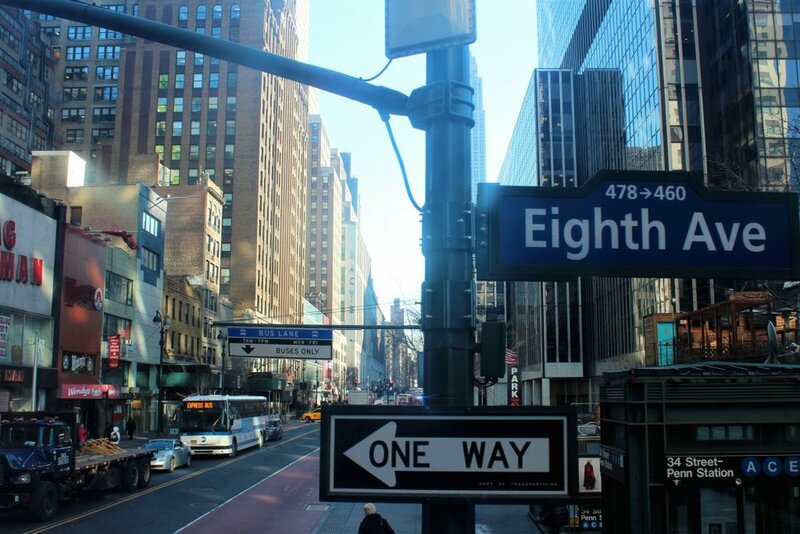 New York City is definitely a shoppers paradise and we love to shop! So day 3 was the day we set aside to do so. We had planned to buy ourselves a few things as well as gifts for family to take back with us, but we totally ended up winging it and had a good old wonder. Our shopping trip began at Macy’s on 6th ave, which was just at the end of the street we were staying on. The worlds largest store for sure, it really is enormous, taking up a full block and 9 floors high. We wondered around a few other stores in this area; H&M, Victoria’s Secret, Swarovski, before heading down a block to 5th Ave.
After walking 10 blocks up 5th Avenue we spotted a familiar looking building at the end of 43rd street, it was Grand Central Terminal. So we wandered off track, to go take a look and we weren’t disappointed. It’s such an amazing building with a bustling atmosphere, everything up to the ceiling with it’s intricate astronomical artwork is highly decorative and beautiful. The station also has an abundance of shops, restaurants and even a market. Since we had made it all the way up to Central Park we decided to scrap our plans for the evening and have a park adventure now, instead of walking back down another day. Central Park is huge, so we only covered the very bottom corner around the pond, zoo, ice rink and Gapstow Bridge. It’s such an beautiful, peaceful sanctuary from the hustle and bustle of the city. There’s nothing quite like viewing the Midtown skyline from Central Park. It sort of puts into perspective how tall the city really is. We wandered around for quite a while until we realized the sun was about to go down. So we set up camp on a huge rock overlooking the ice rink. It really was magical, just peacefully sat there watching as the sky turned dark and the lights of New York City started to flicker on in the foreground. Thursday was another beautiful day in New York City, you can forgive the crippling below freezing temperature when the skyline is sparkling in the sunshine against a clear blue sky. What better way to see the city on a day like this, than taking a cruise around Manhattan Island to Brooklyn, so that's exactly what we did. After breakfast we headed 6 blocks west, through Midtown to the piers on 12th Ave, and caught a boat. We got off the boat in Brooklyn at Pier 1, Dumbo. We were immediately greeted by the most amazing view of Manhattan. We had a full wander around Dumbo, along the riverside and around Cadman Park Plaza towards Brooklyn Heights. Before heading back down to Dumbo to take the most of the great photo opportunities, we took a pit stop at Grimaldi's for the best pizza ever! 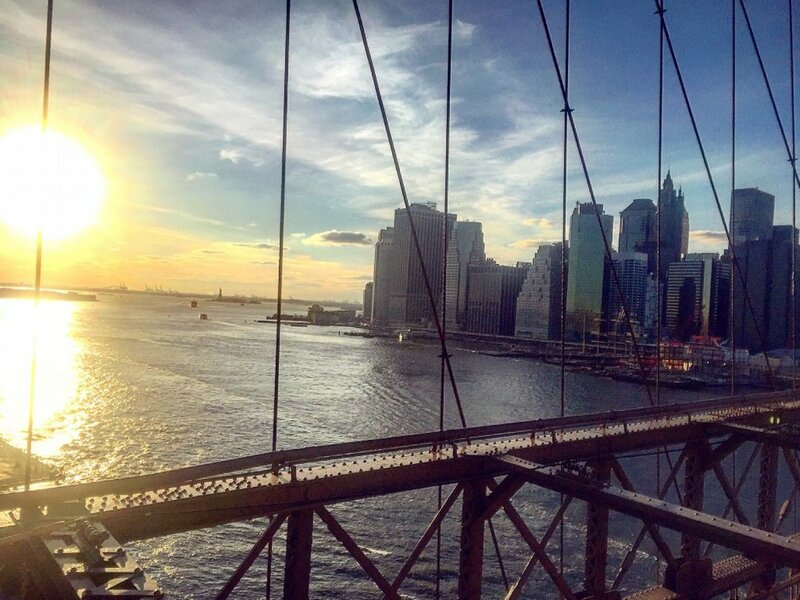 We headed back over to Manhattan via a sunset stroll across the Brooklyn Bridge. With our Starbucks in hand we ventured up to the bridge and were totally blinded by the amazing sunset. The only time I've had to rock the hat, scarf and sunglasses combo. By the time we reached the other side, the sun had completely set and the temperature plummeted. This didn't stop our walking tour of NYC though, we carried on and walked the 4 miles back up to Midtown via Tribeca, Soho, East Village and China Town, popping into shops on our way. I think we pretty much covered the whole of NYC by foot that day, well that's how we felt once we reached our hotel room later that night! As we headed downstairs to breakfast the news stations going crazy about 'Storm Jonas' which was heading towards us. We had been checking the weather all week and were expecting a little snow maybe but it was pretty uncertain all week about whether the full storm would hit NYC or just pass by. We had joked before arriving about getting snowed in New York but we never thought it would be an actual possibility. After breakfast and watching people around us freak out on the phone to their airlines, we headed back upstairs to collect our coats. Once in our room I discovered a text from British Airways "your scheduled flight tomorrow out of JFK has been cancelled, please call us to reschedule". Noway, this is totally happening! Jordan didn't believe me at first. But after a quick phone call we had booked onto a flight a day later than planned, we were getting a full extra day at no cost, total bonus as we were definitely not ready to leave! So in high spirits we headed out on a Subway adventure to make the most of the day before the storm arrived. As soon as we arrived in Soho after navigating the Subway, i knew instantly it was my favourite area. We had passed through the day before very briefly but we never wandered around properly until today. The streets were picturesque, lined with townhouses, independent stores, bakeries, art galleries and more upscale boutiques. After a little shopping spree we stopped off for a coffee on the go from Maman, After a further wander round we decided all of our walking had entitled us to a two course cocktail lunch. We tried out Morini on Lafayette Street, which was totally delicious. After more walking and shopping we had worked up an appetite for desert, we just had to visit Dominique Ansel's Bakery whilst in Soho, home of the cronut. The line was super long and unfortunately they'd ran out of Cronut's but we did get a Smore and a DKA, both were delicious and worth the long wait in line. After venturing back on the Subway to Midtown, we had a quick freshen up at the hotel, drank some beers and wandered across to Madison Square Gardens to watch an NBA game. The atmosphere at the garden was totally awesome yet again and we were lucky enough to get another free scarf but the game totally sucked and half of the arena walked out after the 3rd quarter. When the game finished and we left Madison Square the first light pieces of snow were just starting to fall at 9:30pm. Despite losing the game, the crowds leaving we're in high spirits at the first sight of snow. On that note, we decided to go to an Irish Bar down the road and get drunk on Martinis and Whiskey. We totally forgot that American measurements are double ours, which made for a fun night. By the time we left the bar the snow was coming down really heavy and was starting to look like a blizzard. We totally didn't know what to expect the next morning but couldn't wait to find out! The next morning we woke to the news that the City would be on lockdown after 1pm, with a full ban on vehicles on the road. With the storm fully upon us throughout the night and into today, the majority of stores and restaurants were closed or were about to close so we were confined to our hotel. We set up camp with a tonne of American treats and snacks, fascinated by the snow outside. Once the storm had calmed down we ventured outside, into the most surreal experience of our lives so far. The streets of NYC were completely deserted, with no cars on the roads and only a few people wondering around. The few people that were around, created an amazing atmosphere dancing with their boomboxes and snowball fighting in the middle of the car free road. I've never seen so much snow in my life, it was literally knee deep. It's always been a dream of mine to see New York City in the snow, but i never dreamed i'd see it like this nor be snowed in! It was a total once in a lifetime moment and one i'll remember always.